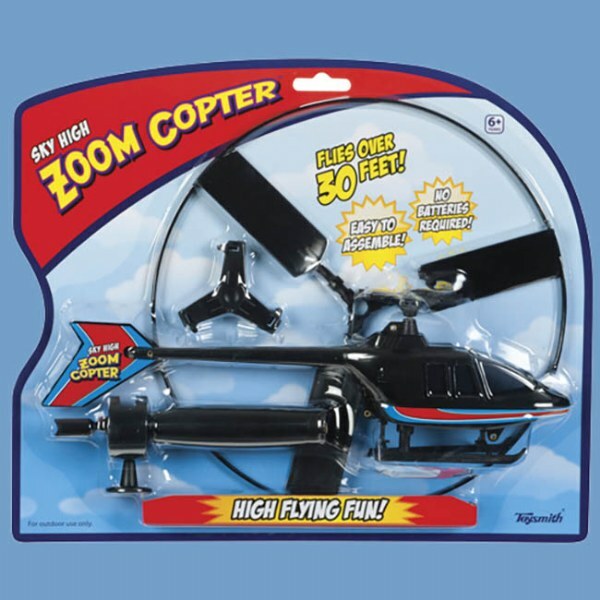 Enjoy hours of fun with this handy Toysmith Sky Zoom Copter. Zoom through the air with this rip-cord helicopter. Soar up to 30 feet through the air with a pull of the rip cord. Power the flight using only human power, with no batteries required. All of the parts are made of safe, high quality materials. This set is recommended for ages 6 years and up. This easy to assemble outdoor helicopter has rip cord launching action and flies up to 35 feet. Rotor measures 9.5 inches across. Grandson having a blast with it. Easy enough for younger ones to use and enjoy.